Are you intimidated by sales? Do you have a hard time with selling a product, even though it’s a daily part of your job or necessary to your business success? Are you afraid of the word “No”? Today, we’re going to take a look at boosting your sales confidence so that you can stay energized and enthusiastic, provide excellent service, stay positive in the face of rejection and start making the money you deserve! You’ve probably already learned a bunch of sales tactics and strategies: how to reel prospects in, how to close, transitioning, qualifying, etc. But we all know that when you’ve put in the work and developed a relationship with a client, it can be devastating not to close the deal. When we hear the word “no,” we instantly feel as though we’ve failed. Even worse: when we take a course in sales and don’t live up to the promises of that course, we feel as though it is our fault—that we’re lacking in some way. To add insult to injury, we then carry that negativity into our next experience and allow it to affect our demeanor, our business relationships and, ultimately, our results. We’ve all been there. In fact, if you’re in sales, you’ve probably felt this way more than once. After a while, you may start to feel as though nothing you’re doing is ever going to work. Here’s what we have to realize if we can ever hope to shift this attitude: “no” is your friend. Many of us treat “no” like an enemy; we consider it a failure. I want to encourage you to expand your perception to see that “no” is actually a success. Now, instead of concentrating on the idea that you have to fail seven times in order to succeed three times, what if you just think of “no” as the required thing you have to hear in order to get to the “yes”? Think about it: that’s three “no’s” for every “yes” . . . that means that once you get your first “no,” you’re only two away from getting a “yes.” You’re one (big) step closer to your next sale! This very subtle shift in perception can drastically help improve your mental state as you go after your target conversion rate! One of my favorite mentors, Steve Chandler, says that, “Yes lives in the land of no.” In other words, if we want to hear the word “yes,” we’re going to have to hang out with “no” a lot. 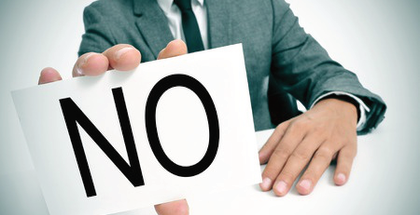 You have to start thinking of the word “no” as a positive thing—you must embrace it. Adopting this mentality will not only help you stay positive, it will also keep you motivated and help you steer clear of procrastination. Of course, this thought process is counterintuitive—it’s a habit you’re going to have to train yourself to enact over time. After a while, however, you will naturally increase your productivity and have more fun in the process. We must learn to celebrate “no.” Even in the event that we still see it as a rejection, failure or mistake, it is valuable to us because it means we’re learning something. During events, I train participants to literally celebrate out loud every time they hear the word “no.” While this may sound silly, it’s amazing the affect it has on the mindset of everyone involved—it changes their faces and body postures, and believe it or not, it is actually changing their brain chemistries. I find this practice so effective that I make myself do it even when I’m alone in my office. We’ve got to train ourselves to think this way. There are too many aspects of life out there programming us to believe that there is only one version of success, and it’s complete and total nonsense. The only way to fail once you start seeing things this way is by not getting any no’s—by not having the conversation at all. “No” is just a natural part of the conversation if you’re a salesman, and if you can start seeing it as a giant leap forward instead of an obstacle in your path, you will start to soar, both mentally and financially. So get out there and start getting some “no’s!” Start collecting them; start celebrating them; get into action and start using them to catapult you to your greatest success! Please feel free to “like,” share or comment below. How do you stay motivated in sales? How do you celebrate “no”? Share your stories and experiences. I love to read your comments and see how you are helping others and yourselves by staying connected. You can also check out other episodes of the show by clicking the available links. If you want to get unlimited, unstoppable power in this area, I highly recommend checking out my module, Confidence Unleashed at confidenceunleashednow.com, where you’ll find an entire section about business confidence and sales!